1 Begin by preparing a large pot that’s big enough to cook the rice. Turn up the heat and throw in the garlic and saute until lightly toasted. 2 Throw in the onions and ginger then add the shredded chicken breast. Toss the mixture and once you smell the lovely aroma from the cooked vegetables and meat. rice. 3 Add the Malagkit rice and saute until rice is covered with oil. 4 When the mixture begins to sizzle, pour the water and bring this to a boil before adding the Knorr Chicken Broth Cubes. 5 Cook the malagkit rice slowly over low fire while stirring frequently to avoid the rice from clumping together. 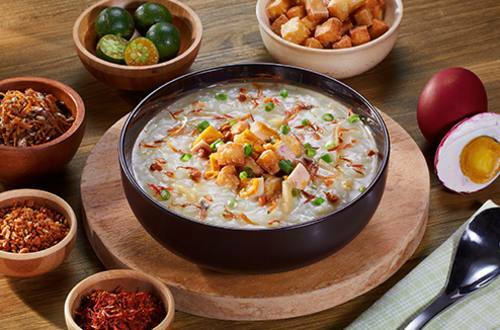 6 Topping your arroz caldo with fried garlic and spring onions does not only give it a lovely presentation but it also adds depth of flavour. 7 Serve this hot in a big bowl. A small cup filled with patis and some calamansi in another plate are just some extra touches you can add to make this dish a favourite in the family.